For bike sharing users around the world, the system may seem quite peculiar indeed. The stations -29 so far located in strategic points of the city- are actually iron cages where bicycles are stored, with no locked terminals. 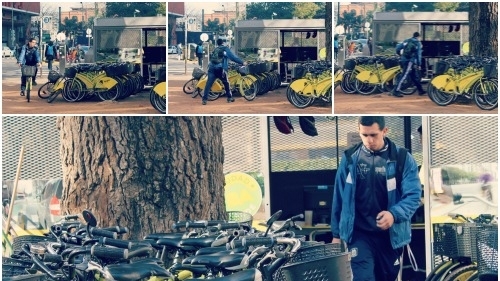 Users are received by friendly staff that are familiar with frequent Ecobici cyclists and even remember their pin number – an ID to check out a bike. “People need to get used to changes, so having personnel at the stations was a good idea. Also, in a small system, having successful bike return is key and that can be provided only with a manual system” says Buenos Aires Sub-Secretary of Transport, Guillermo Dietrich. A friendly Ecobici website that includes real time availability at each station and a complete map of the bike lane network in the city. A mobile app showing availability, offering the best routes and also a system to report irregularities via a photo upload. Data on the bike sharing system on Buenos Aires’ Open Data site where several databases are shared, opening up opportunities for entrepreneurs to develop useful applications for users. Also, during this initial phase, and with the aim of attracting users, Ecobici is free. Just an ID card along with a bill for proof of address and you are good to go. From the initial 3 stations, 72 bikes and 100 trips per day in 2010; to 29 stations, 1,000 bicycles, and about 72,000 registered users who make around 5,000 trips every day, more and more people are being encouraged to use Ecobici. So the plans for the future are quite ambitious: expand the system to 200 stations, with a minimum of 3,000 bikes available and a new hybrid system, in which both manual and automatic stations will coexist. This will to provide a better user experience, improve real time information and reduce waiting time at stations, while maintaining one of the key advantages of the manual system: the successful return of bikes. All these efforts are enshrined within a broader strategy, which isn’t limited to bike-sharing. Buenos Aires has adopted a holistic vision with the Sustainable Mobility Plan, which includes interventions in public transport, cycling – bike-sharing system and the famous bicisendas, traffic calming, healthy habits and road safety. The World Bank is providing a lot of support to the city within this frame, through the organization of technical exchanges between Argentinean cities, workshops on pedestrian safety, walkability and the publication of a street’s design manual, reinforcing the view by which infrastructure design and government training is a key element to reduce fatalities. 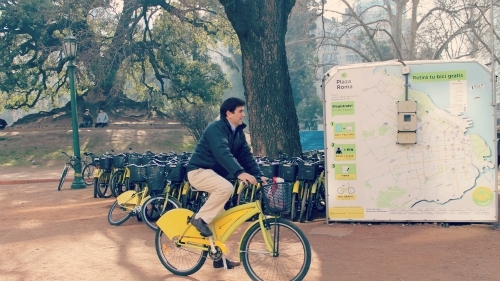 Buenos Aires’ yellow bikes show us that bike sharing is not a one size fits all solution. Instead there is a wide range of options that can be tailored to a city's needs. Although we still don’t know how the new system will evolve, we are sure that the dedication and effort behind the bike sharing system will guarantee that porteños have one that they can be proud of.